If you follow me on Instagram, you know we just got back from vacation! 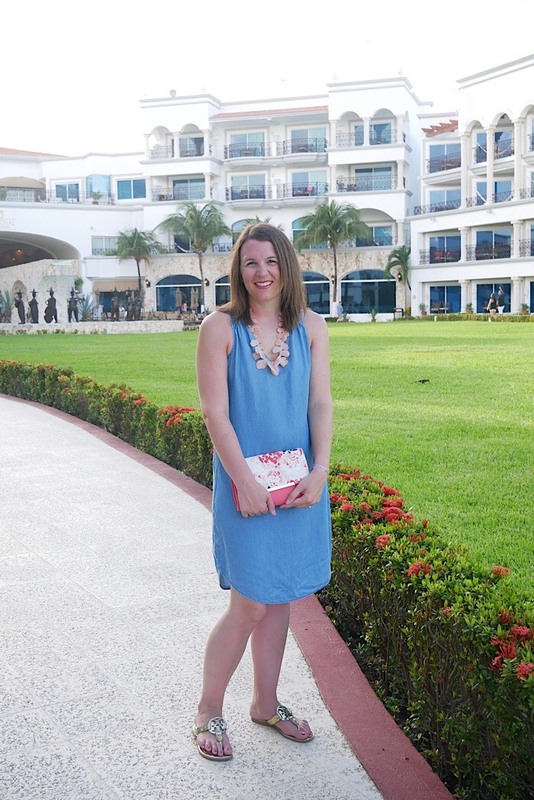 Russ and I went to The Royal in Playa Del Carmen for five nights and it was glorious! 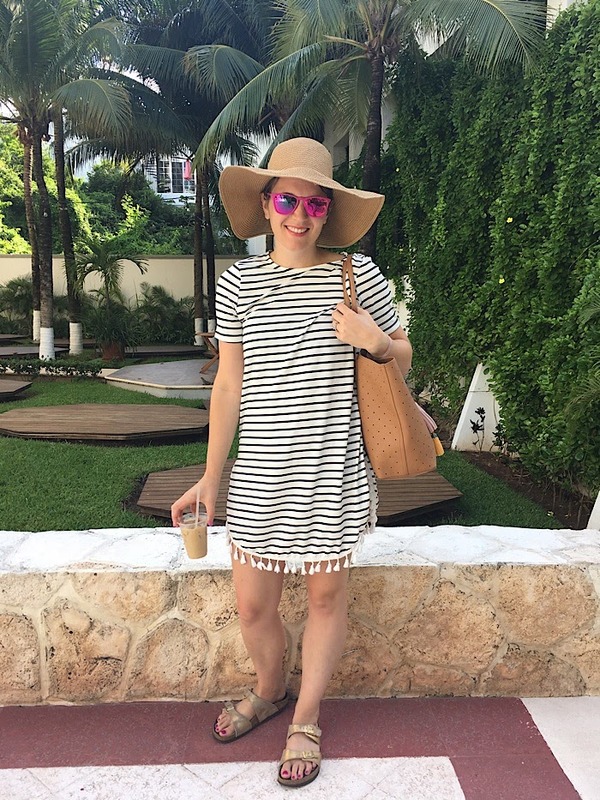 Today I wanted to recap what I wore on the trip! I wore most of what I packed, but I will make a few changes for what I will take next time. I'm not going to go into detail about where every single piece is from just for the sake of my sanity, but I will highlight a few pieces and share some about each outfit. 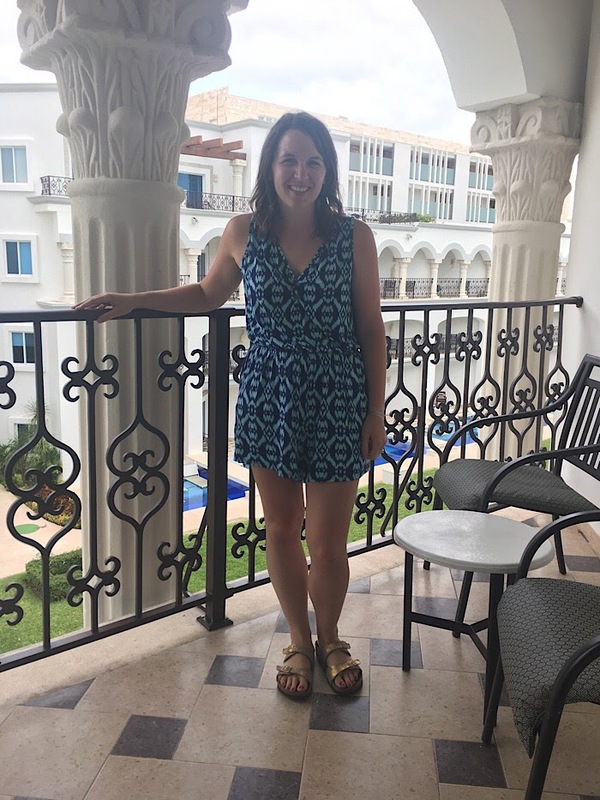 For traveling to our destination, I wore my Stitch Fix romper (see a better picture in my Stitch Fix Review post). This was the item that I kept from my last fix! 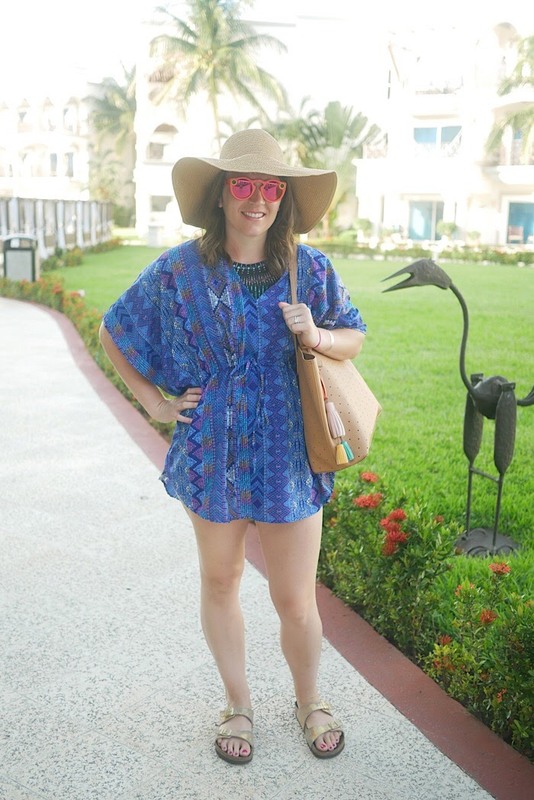 I'm sure some people would say don't travel in a romper for a variety of reasons, but this one is so comfy! I brought a sweater for on the plane and I'm so glad I did because it was chilly. I also at the last minute decided to bring my Birkenstocks along. I'm glad that I did this too because they're easy to get on and off in security and they are comfortable for walking! And I totally realize the lighting is terrible in that picture, but that's what happens when you're tired from travel! After we got to the resort, we cleaned up and went out to dinner and shopped a little. 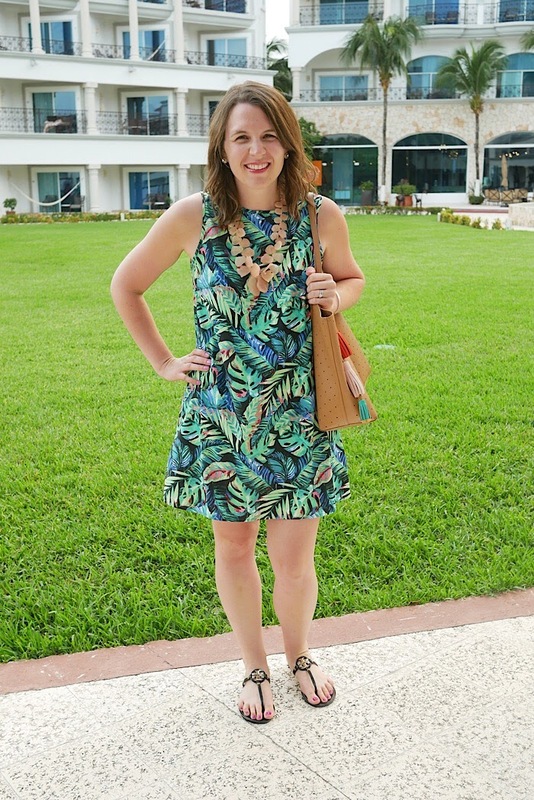 I wanted to give in to the tropical vibes right away, so I wore this cute palm print dress I got at Walmart! I have the same print in a tank and I love it! 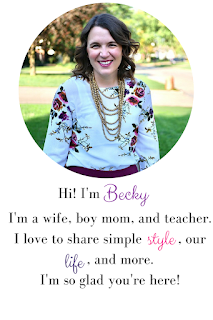 I had been on the hunt for a pink necklace like this ever since I regretting putting back the SugarFix one from Target and I finally found one online from DSW (here) that didn't cost a fortune. This is one of my favorite pictures from the trip because it just has a total resort vibe! 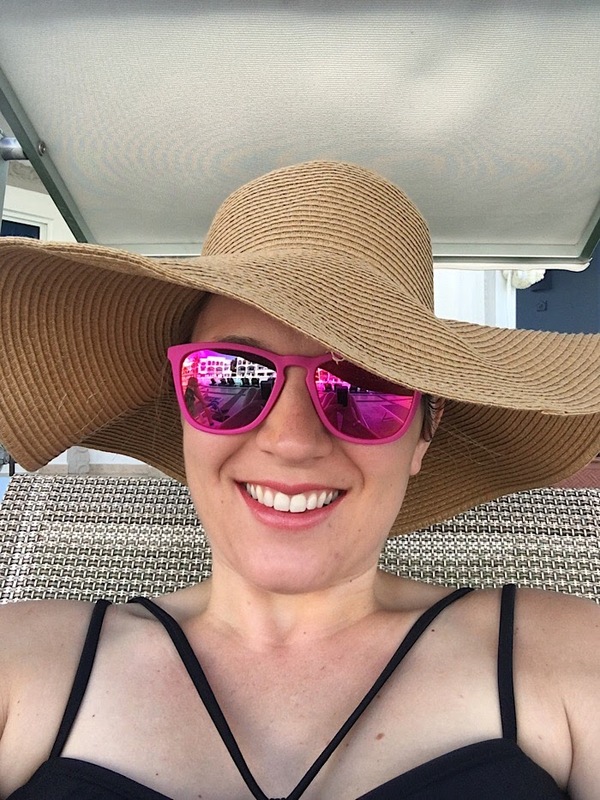 I bought this floppy hat in prep for the trip. It says Beach Please on the brim in sequins (though I totally never got a picture of that on the whole trip). 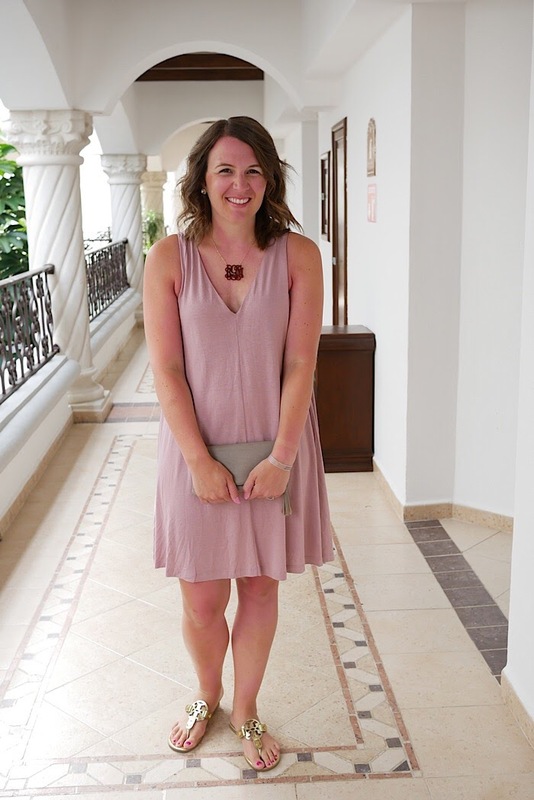 The dress was a piece I picked up from Shein and it made the perfect cover up! I didn't really get any swim suit shots, but all my suits were two piece high waisted bikinis. I am becoming more comfortable in my body, but high waisted suits are going to be a go-to for me for a long time if I do wear a stomach-showing two piece because I have lots of "tiger stripes" aka stretch marks from my babies. Not that I'm ashamed of my "stripes," but I feel better if they're tucked in! All of my suits for this trip were from Target. The Merona high waisted bottoms are one of my faves. I have them in navy and black. This chambray dress was another of of my favorite pieces from the trip. I got it from Old Navy with our rewards bucks and it was so simple and cute for a night out. I added the pretty pink necklace and went minimal on other accessories. The dress does have a little cut out in the back, which was perfect for a racer back lace bralette to peek through. The clutch was a last minute sale find at Charming Charlie and I thought it went so well with this outfit. Cover ups and floppy hats were my go-to. I wore this cover up last year. It was a sale find from Target. My Old Navy tote was perfect for hauling things like my Kindle and Russ's camera and GoPro to and from the pool. This dress was another Old Navy purchase with our rewards bucks. 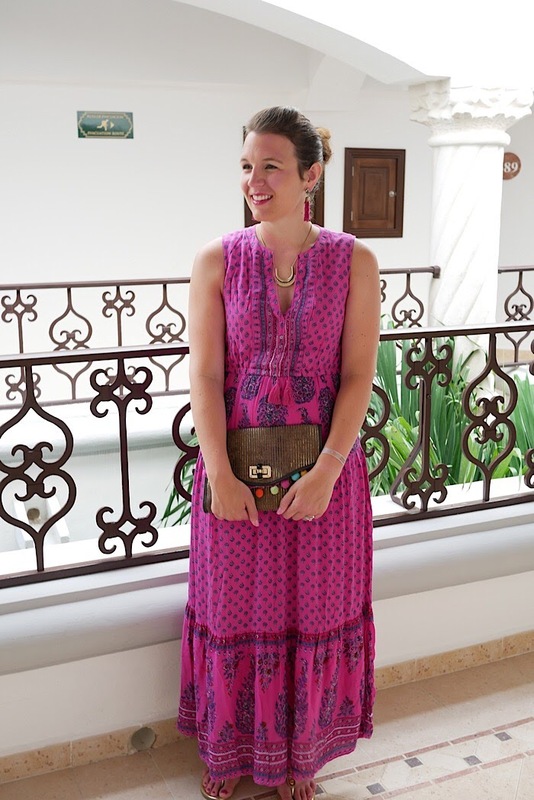 It was a little warm with a long skirt, but I thought the pattern and color was perfect for vacation. I added a simple necklace and fun tassel SugarFix earrings and was good to go. The clutch was a DIY I made last summer and it goes with just about anything. I actually bought this dress at H&M on the strip in Playa, so I didn't have planned accessories for it, but I think I pulled things together well. This was our last night at the resort and I got a little sun-kissed that day! 1) I have one more outfit I will share with you in its own post. 2) I wore shorts and a tank top on the way home. 3) I took another romper that I wore with a kimono around the resort one day but I didn't get a good picture of it. 4) I took a couple dresses, shorts, and tank tops that I never wore. I need to remember this when I pack next year. It's always nice to have an extra outfit or two, but I still did over pack a tiny bit. I basically don't need much daytime wear besides swim cover ups. 5) I took two pairs of wedges but I only wore one pair one night. Next year I may not take any wedges at all and stick with flats as we do have to walk a lot around the resort, even to go to dinner. So, that's a wrap on the trip! Basically we ate great food, I read three books, and we spent a lot of time lounging by the pool. 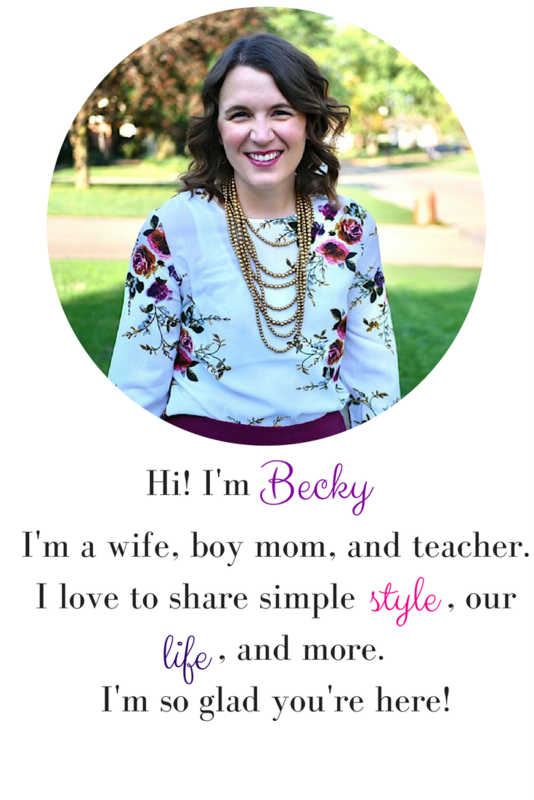 It was the perfect trip for this mama to reconnect with her husband and relax!